The Master's program in Human-Computer Interaction (MHCI) Carnegie Mellon University gave me the ability to work in a student team with industry sponsor The Boeing Company to implement an iterative research/development/design process. This project began in January 2014 and was completed in August 2014. 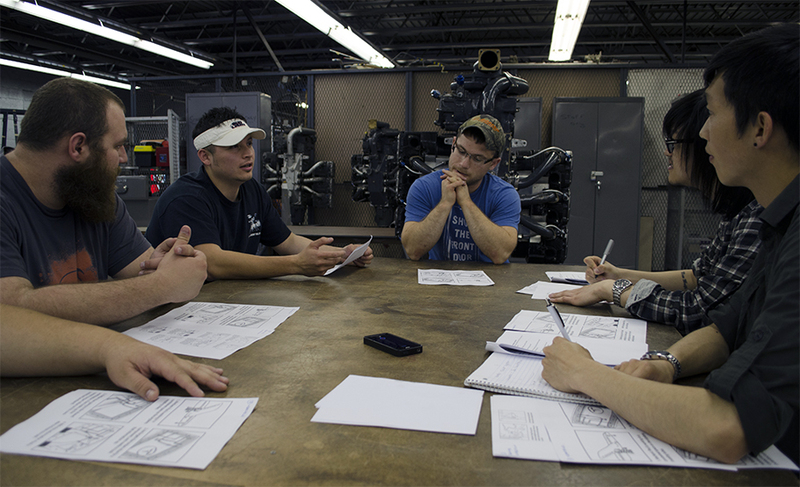 Final deliverables include a high-fidelity prototype, concept video, research findings report, design process report, and website. Due to the proprietary nature of the project, I cannot disclose research findings online. However, I will document the process involved to achieve our final result. Our team first brainstormed a team name and logo, which took multiple reiterations of conceptual ideas. Our team name Sora means "sky" in Japanese. The consistency of our branding identity was important, so we determined our typography, layout, colors, and styles for collateral for our clients. To expand our domain knowledge and determine our problem scope, we read 25 research papers and interviewed 6 professionals in analogous domains to compare the work of related industries and problems. Over two trips in February 2014, we travelled to the Boeing factories in Seattle and Renton to observe and speak with factory employees face-to-face. Using contextual inquiry, we learned about their workflow and company culture. In total, as a team we spent 90 hours on the floor, speaking with over 60 participants. 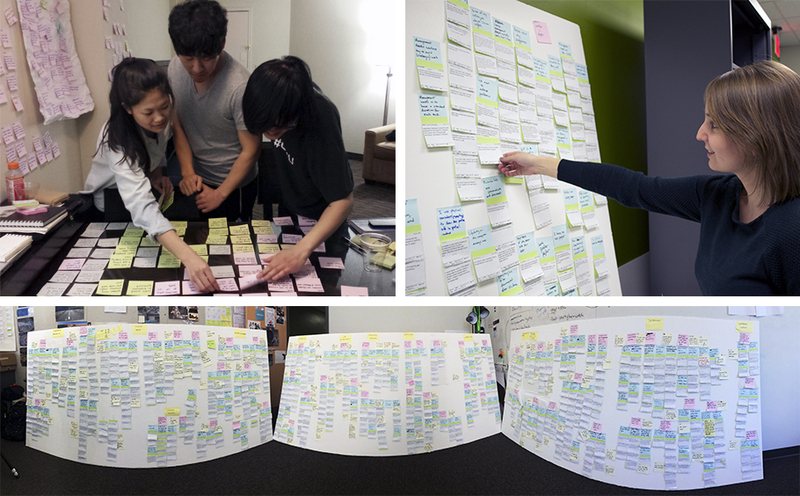 Using affinity diagramming, we identified patterns from our 850+ field notes. We categorized these under 12 themes and narrowed them down to three major key findings. We also performed a node-and-link style mind map to capture cause-and-effect relationships. Flow models were created to visualize information flow through people, systems, artifacts, as well as reveal breakdowns in employees' work. Based on our data and findings, we generated possibile opportunities and design ideas (or "visions") that we plan to prototype and test in the upcoming months. We generated over 100 ideas. 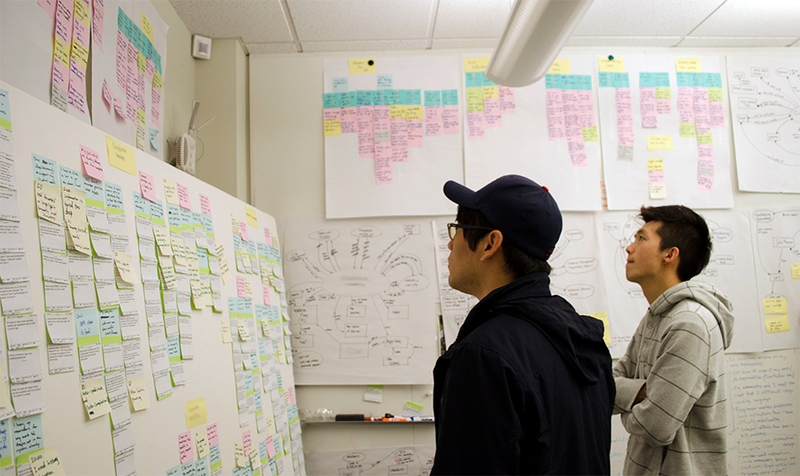 Out of our 100+ design concepts, we plotted the most promising ideas over a feasability matrix. Over 5 stages of iterative design and evaluation cycles, we further funneled these down to a single final prototype. In our earliest iterative rounds, we retrieved feedback about initial design concepts by presenting them in the form of storyboards. This allowed us to explore use-case scenarios in rapid succession to learn about user’s needs and eliminate concepts that would be considered inappropriate for the users' work. We then visited the Boeing Renton factory in June and July to test our design choices with Boeing employees and further refine our prototypes. From low-fidelity to high-fidelity prototypes, we gradually narrowed our scope of design choices by iteratively testing design concepts as well as product usability and features until only a single product in the form of a high-fidelity working prototype remained.